Beavercreek was paired up against the Dublin Coffman Shamrocks Friday night for an opening round OHSAA Hockey Playoffs game at the Ice Haus next to Nationwide Arena. Creek found themselves as the 12th seed in the Columbus Region while the Shamrocks were the 10th seed. 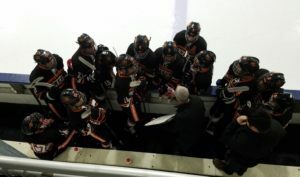 It has been a number of years since the Beavers were able to win an OHSAA Hockey Playoffs game and they and their fans were hoping that this would be the night. The game started off slow for Creek and they appeared to be over matched against the faster and more physical Shamrocks team. Dublin Coffman worked the puck tediously in Creek’s zone and were able to score a couple of goals off deflections. By the time the ice chips settled, the Beavers found themselves down 3-0 after the first period and there was a feeling that this may turn into a rout. Something must have been said in the locker room at the break or perhaps the team just settled down, but regardless the real Creek Hockey team came out to play in the second period. The Beavers found themselves on back-to-back power plays to start the period and as the second one expired Thomas Bush gathered a clearing pass from Braden Cox, skated into the Shamrocks zone, and beat their net minder with a wicked off angle shot. The deficit was now reduced to 3-1 and although their was a sense the game may be shifting, the Creek Hockey faithful knew that next goal was going to be huge. Late in the second period on a power play opportunity, the Beavers meticulously passed the puck around and were finally rewarded when Mason Mikesch connected off a feed from PJ Kosir, cutting their deficit to 3-2. The Shamrocks pressed hard at the end of the period to extend their lead, but the Beavers were up to the challenge, and the game remained at 3-2 at the second intermission. Dublin Coffman came out strong in the third period but Creek was ready for them as the two teams skated up and down the ice without a whistle for the first 5 minutes of the period. The whistle finally came when Joey Duford shot a blast from the point and Cole Gutterman gathered the rebound and passed it to a wide open Mikesch, who then buried the shot, tying the game at 3-3. The game continued to go back and forth with each team getting scoring chances. With less than 5 minutes left in regulation, Bush found Mikesch on a clearing pass, who then first beat the Shamrocks defensemen and then beat their goal tender on a wrist shot, giving the Beavers a 4-3 lead. This was a natural hat trick for Mikesch, his 9th hat trick of the season, and it could not have come at a better time. Dublin Coffman had their backs to the wall and came out with everything that they had. With a little over two minutes remaining in regulation their tenacity finally paid off and they were able to get the equalizer. Both teams had chances in the closing minutes of regulation, but the score remained 4-4 and the game went to an 8 minute overtime. It appeared that the Shamrocks had the momentum in OT and dictated much of the play. 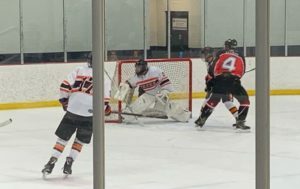 The Beavers even found themselves on a penalty kill late in the period, but were able to sustain it primarily due to the stellar play of their goal tender, Kevin Bovair. Bovair was excellent the entire game, but really stood out in the first OT when the Beavers were out shot 16-1 and he ended up with a whopping 58 saves on the night! The game was not decided at the end of the first OT, so it went to a second OT after an intermission. 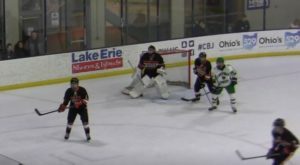 The second overtime started in a four-on-four format, per OHSAA Hockey Playoff rules. Creek came out flying and had a number of grade ‘A’ scoring opportunities, but were unable to score. Late in the second OT, the Beavers had a two-on-one opportunity, but it was denied and the Shamrocks skated up the ice and were able to score the game winner. As heartbreaking as it was to lose a game like this, the Beavecreek Hockey players having nothing to be ashamed of. They gave it their best and left it all out on the ice. 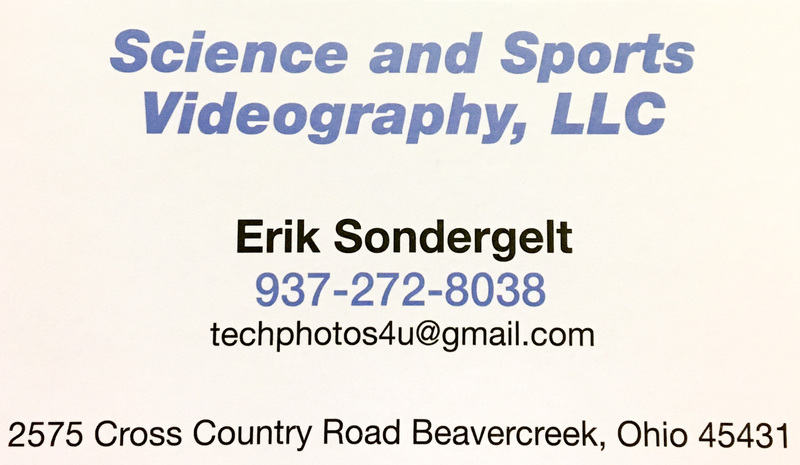 As a fan, this author applauds them for their effort and would like to convey to them what a treat it was to watch what was by far the most exciting Creek Hockey game that I have ever witnessed! Thank you boys!! 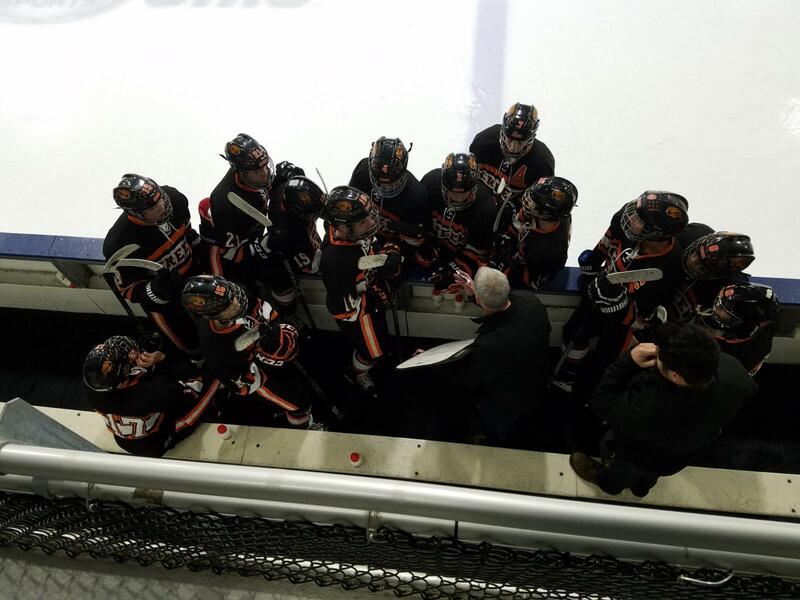 Although the Beavers have been eliminated from OHSAA playoff play, they have one final tournament in two weeks that is being hosted by Academy Hockey at the Springfield Chiller. 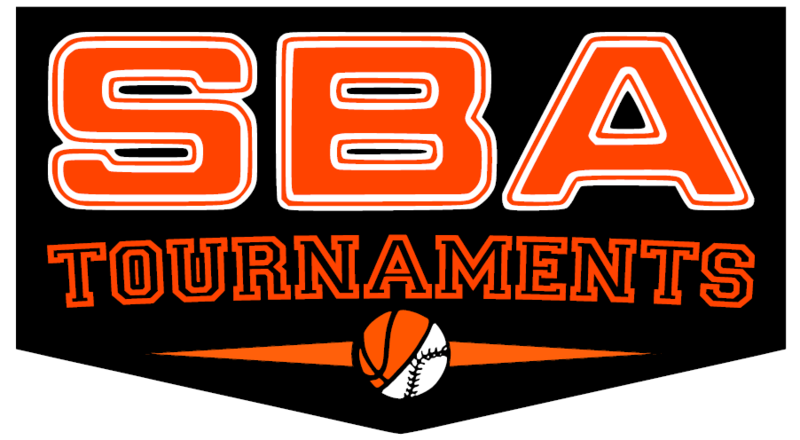 Creek’s next game will be Friday 3/1 at 9:40 PM against the La Salle Lancers.